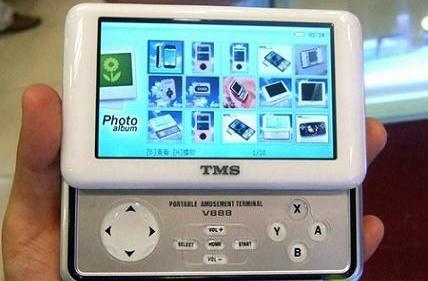 The Chinese manufacturer, Thomson (TMS) has offered a new (PMP) portable media player with slider design, named as V888. The cool and stylish player fetures four inch TFT colour screen and can support wide variety of file formats including MPEG, Mpeg4, Divx (3.11,4. X, 5.x) Xvid, MOV, WMV (7.8), AVI, ASF.VOB, H.263, MP3, WMA, WAV, FLAC lossless, Jpeg, Bmp, Png, Tiff as well as text and game emulator. Besides, it also features an integrated mic for voice recording and an SD expansion slot. The cool Thomson V888 PMP will be available in China for about $132 but no words on its availability in other areas yet.